Penguin Press, London, March 2017. Cover image from an original poster by Len Breen & Juan Muñoz, designed and produced in London in 1978. Cover: The Culture of Fear © Juan Muñoz and Len Breen (1978). Reproduced by kind permission of Len Breen, the Estate of Juan Muñoz anf Marian Goodman Gallery. Everything that can be used to resist the culture of fear is a sign of out living culture. 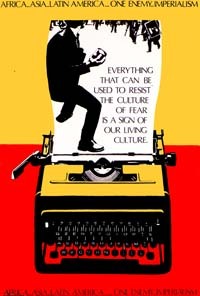 The basic collage (finished as a serigraph) of a typewriter and 'a revolutionary', from the 1968 student demonstrations in Paris, was compiled by Juan from the refuse/pile of discarded images at the Central School of Art annex - and elsewhere. In the final design I switched the handing in a hand-drawn version into the design. The quote and slogan, reproduced with 'Letraset', was chosen from popular texts/slogans of the time. I produced the final design which was finished in gouache. We later entered the poster for the Baghdad International Poster Competition/Exhibition 1979. Although the work was originally a cooperative collaboration and so entered into the competition in both our names, it was, for 'political reasons', and since another of my posters had already been given a 'Special Award', and in a begging request from the press officer of the Iraqi Cultural Centre (ICC), Kate Aldridge, to widen the international profile, credited solely to Juan. It was awarded a distinction and printed in a 10000 (estimated) offset run and as a postcard by the ICC in London. I (well) represented Juan on the trip to Baghdad! It was exhibited in London, Baghdad and touring in Europe and the Middle East. The original poster was later presented by me to the Iraq Museum of Modern Art through the Iraqi Cultural Centre in London. Juan at the Central School of Art Studios, London (1977). Photo by Len. Juan Muñoz who tragically died at the end of August 2001 was a friend and colleague. We met at the Central School of Art and Design in the late 70's and worked together through the early 80's. We partied somewhat in those days but more significantly collaborated on some important political poster productions of the times. This work included the design and production for Latin American Solidarity, Chilean Solidarity and various issues focusing on the Chilean struggles around Salvadore Allende. With David Dahlson we also created all the visual propaganda for the Central School Occupations - part of the protests by art colleges against fee increases for foreign students.